Firefighters are fending off a major blaze at Notre Dame Cathedral in Paris. A fast-moving fire has consumed the roof and spire of Notre Dame Cathedral in Paris. Now, there are fears of irreparable damage to its historic interior. The Gothic cathedral has stood as a symbol of Paris for more than eight centuries, dating back to a time when the city had fewer than 100,000 people. It now draws more than 30,000 visitor per day, or about 13 million per year. They come to marvel at its stained glass windows, to touch history, to pray to God. “Every surface, every stone of this venerable pile, is a page of the history not only of the country, but of science and of art,” he said. Guide Pamela Breit was leading a tour group on Monday when she saw yellow smoke and realized there was a serious fire. “The windows from the 1300s were exploding. I just hope that something is left for us to show our visitors in the future,” she said. Breit said she is concerned that the wooden ceiling – much of its timber dating back to the Middle Ages – has been destroyed. She is also worried about relics associated with Jesus Christ, including a piece of the true cross and the crown of thorns. “I can just hope that they have rescued these objects before it’s too late,” she said. Breit notes that the cathedral took about 200 years to build. “You can imagine how many generations worked hard to see this become a reality,” she said. Kathryn Brush, a professor emeritus of art history at Western University, told CTV News from London, Ont., that she gasped in horror when she saw the news. “With the collapse of the spire, I really fear for the interior and for all of the liturgical furnishings inside: precious altar pieces, sculptures, tapestries and religious objects of various sorts,” she said. “The weight of that spire would have been quite tremendous,” she said, noting that the 19th-century structure was made of bronze. “I’m very worried about the stained glass,” she added. 1163: The cornerstone of the cathedral is laid by Pope Alexander III on the site of a Roman temple to Jupiter. 1345: The cathedral is finally completed. 1431: Henry VI of England is crowned inside. 1455: Joan of Arc’s mother, Isabelle Romee, arrives at Notre Dame to appeal for her daughter at her trial. 1793: Revolutionaries ban Catholicism and rename Notre Dame the Temple of Reason. A Festival of Reason on Nov. 10 celebrates secular principles. 1801: Napoleon restores the status of the Catholic church and saves the cathedral from destruction. Three years later, he is crowned emperor inside. 1831: Victor Hugo releases “The Hunchback of Notre Dame,” his famous novel set inside the cathedral. 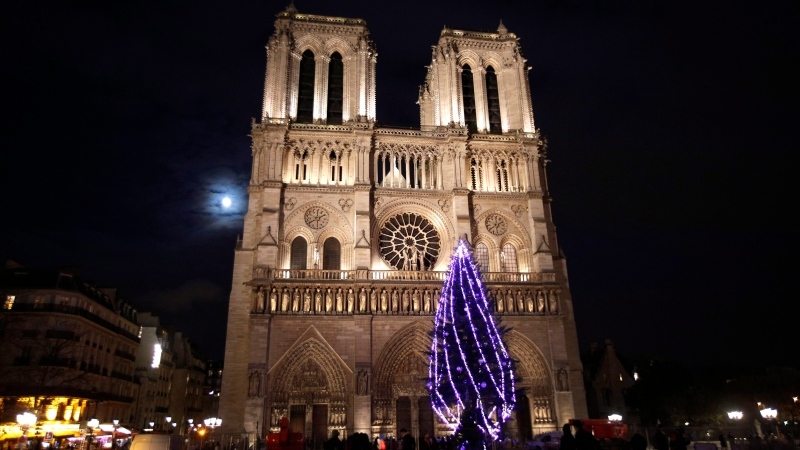 2017: A charity appeals to donors for 150 milllion euros to restore and repair the cathedral.